You've got 7 days 'til Christmas, and you are STILL trying to find a quick pattern to use to make awesome gifts. I'm here to help. I'm giving you the pattern for this scarf for the low, low, price of...FREE! Let's call it my Christmas Bailout Plan. You're desperate and "too big to fail". I'm here to make it all better. Like Obama. But not really because I have breasts. 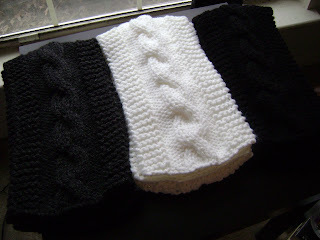 The scarf is knit using bulky weight yarn on size 13 needles. It took me 3 days to make one scarf, and that was from just knitting for a few hours after work. You might be able to finish one faster if you've got more time during the day. Great pattern, and I LOVE your sense of humor!! !